Visited the Alien Invasion at the Spinnaker Tower recently. 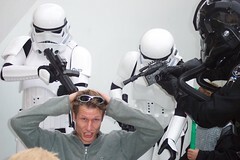 The best bit was the Storm Troopers from the UK Garrison. Scarily realistic!